Having a solid backup and restore software for your server virtualization hypervisor setup is highly essential to protect business critical virtual machines and important data. Easy backup/restore is one of the main advantage of having private cloud (virtualization environment) at the datacenter than physical servers. Selecting the suitable and best backup software for the Microsoft Hyper-V or VMware vSphare/ESXi is always critical, because you need to meet the technical and IT budget requirements in your organization. This article lists out few important considerations and tips to select the best backup software for Hyper-V or VMware hypervisors. There are plenty of free and paid backup software available in the market. Selecting the correct and best backup software mostly depends on the hypervisor, host Operating System, Virtual machine Operating Systems, the applications running inside the VM’s, cluster/non-cluster environment, storage in use and complexity/time of backup and restore jobs, Cost of the backup software and support. Obviously the software should support your existing hypervisor OS such as Windows 2008 R2 (v2) or Windows 2012 R2 Hyper-V (v3) or VMware ESXi4 or 5. If the host OS is officially not supported, then you will face some issues in installing the backup software, scan host server and virtual machine resources. Regarding guest OS, make sure it can take backup of the virtual machines you are hosting. For example, if you have several version of Windows , Linux or even Solaris VMs, can it work with them?. The guest OS compatibility is highly important for proper backup and restore (to perform Item level recovery to recover something inside virtual machine). The backup software should be easy to install and use. Some of the hypervisor backup software are very easy to install and deploy. They have good GUI installation screens, built-in database features and able to discover the existing setup of hypervisor without any additional configurations. On the other hand, few software need to be installed with high technical knowledge and in complex topology. You may need to setup several servers, run few scripts, modify some of the configurations, and several other components to be installed. Making a small mistake somewhere may hamper the entire backup installation solution. Also the backup and restore procedure should be simple and in non-complex format. Few programs provide very easy and cool backup jobs creation, execution, scheduling and monitoring tasks views. At the same time, few programs will have complex screens and options to run the backup or restore jobs which will be an extra headache. Though we already mentioned the ease of backup and restore jobs, the ‘time’ is very important when you have more virtual machines to backup in short time. The virtual machine backup time mainly depend on the technology, features, tweaks and acceleration methods the backup software uses. It’s always highly recommended to install the demo version or do a POC of the backup software to find out the suitable product for your IT infrastructure environment. If one software can backup a virtual machine faster than other software and restore procedure also same, then you must consider to buy the fastest backup solution. That will save time and allow you to to take more backups during the allocated time which is mostly at night time. The technologies used in a software to perform backup or restore are considerably major part in deciding which software is good. It influences the time of jobs. If the particular hypervisor backup software supports all kind of latest technologies, products and hardware in the market, then mostly it will support your environment too. Integrating with your existing hardware such as storage, network devices and it’s features will improve the performance and time duration of the backup/restore. For example, if you are hosting virtual machines on NetApp storage and the backup software supports NetApp integration and it’s features (such as NetApp LUNs, snap mirror etc), then it is going to work well for your private cloud. Usually hypervisor backup software uses Microsoft Windows shadow copy service to take backup of virtual machines on Microsoft Hyper-v. Its having several drawbacks such as slow backup and restore. But if the backup software supports hardware VSS writer in storage level, then it will use the storage VSS writer to take backup without affecting the performance of host and guest machines. It’s fast, simple and not much load on hypervisor host server. Also, the restore will be faster than traditional snapshot method. Some software will install their own VSS writers to make the backup and restore smooth. In this case, you have to see how compatible these 3rd part VSS writers with the storage and hypervisor host. 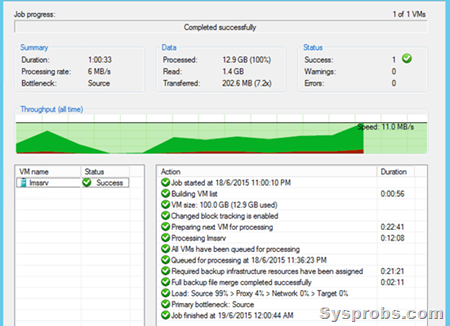 This is another feature you must consider while selecting the best backup software for Hyper-V or VMware. Some of the virtual machine backup software can read inside the virtual machines and understand the applications running inside, they are application awareness. By using these type of software, you can perform item level recovery whenever needed by using virtual machine backup. For example, if you have a virtual machine backup of domain controller, you can restore an OU or user from Active Directory by using it.Remember: you do not need to install any agents or clients inside guest virtual machines, it purely works from VM backup level. It’s a nice and useful feature you must consider when you want to protect your virtual environment. Here is the item level recovery of active directory object by Veeam backup software. Check whether they support the backup destination mediums that you are using currently or will be using in future. For example, can you backup and store a virtual machine to your existing tape library?, do they support it?, or how about SMB share? or iSCSI or NAS disks?. You must verify the compatibility and flexibility of using your existing destination mediums. Of course, this is the major part while selecting the final product for your hypervisor private cloud setup. First decide your environment size, number of virtual machines, supported hosts and other features you will be needing from the backup software. Then decide whether you can accommodate these required features without buying additional hardware and with the lowest cost backup solution. Buying a high-end backup solution but not using the all features of it is an unnecessary expense in IT budget. Always select the solution which is having needed features by you and for the best price. How quickly you can get the support from the vendor? can they support physically or telephone or online?, do they provide patches and upgrades for the price you pay or you have to renew the licenses to get updates?, if so, how much is the cost of it?. Consider these facts while selecting the backup solution for your Hyper-V orVMware hypervisors. Some software provide monitoring and notification features. The backup and restore process can be monitored by web portal and you can allocate access to other IT staff with specific roles. Notifications can be set to send as email or SMS about the successful or failed jobs. These type of features will enhance the backup/restore procedures and allow better monitoring and task allocation by sharing IT duties in the organization. Though we are considering about hypervisor backup software, but how about additional features from these software?. For example, can they backup physical servers or physical file/folder locations or how about the backup of the backup server?. These types of add-on features will bring more value for the backup software and worth the money spending on these software. I hope these above points will give some ideas on selecting the best backup software for your Microsoft Hyper-V2 or V3 and VMware vSphere servers. It’s almost like one time investment and you can’t change the virtual machine backup software just like that if they do not work at your data center. Prior analysis, POC and proper investigations are highly required to select the best backup hypervisor software to protect private cloud.